Frances Chamberlaine Sheridan (1724 -1766), celebrated novelist and playwright, is remembered today primarily as the mother of famed playwright and politician Richard Brinsley Sheridan. She was, however, a talented and influential writer in her own right, highly regarded by Dr. Johnson, James Boswell, Samuel Richardson and David Garrick, and a literary matriarch whose descendants included three generations of popular playwrights, novelists and poets. Although young Frances was forbidden to learn to read by her rigid clergyman father, Dr. Philip Chamberlaine, she was fortunate in having three rebellious brothers who tutored her in English, Latin and botany. Frances became a voracious reader and writer and penned her first novel, a two-volume romance, Eugenia and Adelaide, at age fifteen. Family myth has it that she wrote it on scrap paper stolen from the housekeeper’s expense records. In adulthood, Sheridan showed this juvenile work to the novelist Samuel Richardson, who was so impressed that he persuaded her to write another novel. In the early 1740’s, Dr. Chamberlaine died, thereby liberating his grown children. 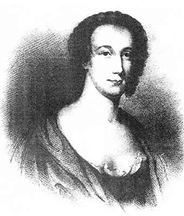 Frances began attending the theater and, in 1743, she entered into the paper war going on between actor Theophilus Cibber and Thomas Sheridan, the popular young actor and manager of the Theatre Royal, Smock-Alley, Dublin, regarding a costume change gone awry. Frances wrote a pamphlet, “A Letter from a Young Lady to Mr. Cibber,” and a poem “The Owls,” defending Sheridan from Cibber’s attacks. Both were published in the Dublin News Letterand they led to her introduction to her future husband. She and Sheridan married in 1747. They had six children, two of whom died in infancy. When Smock-Alley was nearly destroyed in 1754 during a political riot, the Sheridan family’s finances were ruined also. For the rest of his life, Thomas Sheridan struggled with debt that required his family to move frequently and suffer long separations. Frances Sheridan began her writing career after she and her husband settled in London following the Smock-Alley disaster. The Sheridans, particularly Frances, who was renowned for her wit and charm, became friends with Dr. Johnson, Samuel Richardson, Sarah Fielding and Catherine Macauley. Indeed, these luminaries seem to have received Thomas mainly out of regard for Frances. (Johnson, after criticizing Thomas’s acting to a friend, once remarked he nonetheless wished Thomas well, primarily because he so highly esteemed Thomas’s wife.) Richardson’s encouragement led Frances to produce The Memoirs of Miss Sidney Bidulph, a skillfully written novel of sentiment, influenced by the style of Richardson’s own Clarissa. It was published in 1761 and instantly became a major success. The following year Sheridan began work on her first play, The Discovery, which David Garrick read and immediately requested for staging at Drury Lane. He himself chose to play the second male leading character, Sir Anthony Branville, and offered the principal male role to Thomas Sheridan. Like Sidney Bidulph, The Discovery was an immediate hit. It played for seventeen packed performances its first season. Critic David W. Meredith notes that Garrick’s choosing to perform the piece seems peculiar. While Garrick publicly declared that The Discovery was the best comedy of the age, he was not on particularly friendly terms with Thomas Sheridan. In the deeply political world of London theater, this antipathy could be easily be enough to condemn even an outstanding play. Meredith wonders therefore, whether, despite Frances Sheridan’s reputation for sweetness of temper, she had satirized her husband in the characters both of Lord Medway and Sir Anthony, and whether Garrick’s sincere admiration for the comedy wasn’t heightened by the prospect of using it to get in a dig at his rival. Frances Sheridan wrote two other plays, The Dupe (1763) and the unproduced A Journey to Bath, which has survived only in a fragment. The Dupe was removed from the stage after only three performances. Critics, while praising the play, have attributed its stage failure to a variety of causes: Sheridan’s unsentimental portrayal of love and marriage, the Restoration style sexual intrigue and vulgar language. The play had much greater success in its published form and earned Sheridan a significant profit. Her last play, A Journey to Bath, failed to find favor with Garrick, and although Sheridan wrote a spirited defense of the comedy to Garrick, she could not change his mind. Modern critics find much to praise in the extant fragments of the piece and Robert Hogan and Jerry Beasley believe it to contain “the freshest most diversified collection of characters that Frances had yet created.” One of those characters, Mrs. Tryfort, a pretentious mangler of the English language, is clearly “borrowed” by Frances Sheridan’s son Richard and transformed into his famed Mrs. Malaprop. In 1764 increasing debts drove Thomas Sheridan to move with his wife and three eldest children to France. Frances continued to write — a sequel to Sidney Bidulph and an oriental tale, The History of Nourjahad, both of which were published posthumously. Lame from infancy, Frances Sheridan had been plagued with poor health for ten years, and, although energetic and spirited to the last, in 1766 her maladies took a turn for the worse and she suddenly died. Branded as “sentimental,” Frances Sheridan’s works have languished in modern times, but recent criticism has noted the ways in which her writing works against convention. Sheridan frequently focuses on marital discord and the way in which women’s lives are bound by patriarchal constraints. She doesn’t back away from the sinister and cold-blooded. Her characters may suffer and be virtuous, but suffering is no guarantee of reward. In her comedies, she freely mixes Goldsmith’s so-called “sentimental comedy” with scenes of wild wit. Sheridan’s fluency and her ability to develop her characters through their eccentricities of language, is remarkable. It is clear that Richard Brinsely Sheridan learned much from his mother’s works, but he only paid tribute to her by pilfering her oeuvre for his own comedies. Frances Sheridan deserves a place in our literary history in her own right. Brunstrom, Conrad. “Sheridan, Frances,” in The Literary Encyclopedia at www.LitEncyc.com. Eachus, Shirley. “Sheridan, Frances,” in Todd, Janet, ed. British Women Writers: A Critical Reference Guide. New York: Frederick Ungar, 1989, 611-612. Hogan, Robert and Beasley, Jerry C. , eds. The Plays of Frances Sheridan. Newark: University of Delaware Press, 1984. LeFanu, Alicia. Memoirs of the Life and Writings of Mrs. Frances Sheridan. London: G. & W.B. Whittaker, 1824. Woodward, Carolyn. “Frances Sheridan,” in Schleuter, Paul and Schleuter, June, eds. An Encyclopedia of British Women Writers, Revised and Expanded Edition. New Jersey: Rutgers University Press, 1998, 569-571.